The below artworks are the most important by Ben Shahn - that both overview the major creative periods, and highlight the greatest achievements by the artist. Artwork description & Analysis: This is the only easel painting out of Ben Shahn's series of twenty-three gouaches depicting elements of the trial and subsequent execution of the two Italian immigrants, Nicola Sacco and Bartolomeo Vanzetti who were accused of murder during a robbery in Massachusetts. At the time and still today, controversy surrounds the guilty verdict, with many believing that the men were condemned because they were anarchists and because of the overt anti-immigrant sentiments of the era. In this painting, the three members of the Lowell Committee who denied the defendants' appeal hold lilies as they stand over open coffins containing the bodies of Sacco and Vanzetti. Judge Thayer can be seen in the background staring out the courthouse window onto the scene. Shahn submitted this easel painting to an exhibition organized by Lincoln Kirstein at the Museum of Modern Art in New York. The museum's Board of Trustees objected to Shahn's depiction of the Lowell Committee members who were friends to many of the museum's trustees. Despite the Board's demand that Shahn's works along with the equally objectionable works by Hugo Gellert and William Gropper not be shown, the many other artists in the exhibition and the curator Kirstein refused to participate if the three artists were banned. The show eventually moved forward including Shahn's work with many of the trustees resigning in anger. The painting's topic provides an early example of Shahn's use of his art against social injustice. This work helped to establish him as one of the great Social Realist painters. Also in the development of this artwork, Shahn had begun to think sequentially about narration through art, a process which ultimately led him to paint his complex public murals. Rather than painting for himself as other modernists did, Shahn painted for the public and for the cause of Sacco and Vanzetti, while simultaneously drawing upon the cubistic forms of Picasso in his figures. Shahn successfully melds together the formal with the political in this work. Artwork description & Analysis: Ben Shahn's 45 foot long x 12 feet high Jersey Homesteads Mural recounts the grand narrative of the Jewish exodus to the United States (1880- 1924), the Jews' quest for a decent livelihood in the punishing sweat shops of the unregulated garment trade, and the importance of Jewish labor unions. The left panel begins in 1930s Germany where a Nazi soldier holds a sign warning Germans not to buy anything from Jews; this threatening image by Shahn was the only reference to Nazi Germany in any New Deal mural. Two women seen mourning at open caskets which contain Sacco and Vanzetti are positioned above a depiction of the registry hall at Ellis Island where the Statute of Liberty is visible through an open doorway. A group of immigrants walking off a ship include representations of Shahn's mother, artist Raphael Soyer, and Albert Einstein who leads the group and who was on the board of Jersey Homesteads. The center panel depicts Jews and other immigrants working in a non-union, unsafe sweatshop. Shahn, a champion of unions, next painted an image which closely resembled President of the CIO John J. Lewis but is not to be taken literally as a portrait. The labor organizer presents a speech and quotes one by Lewis: "One of the great principles for which labor and America must stand in the future is the right of every man and woman to have a job, to earn their living if they are willing to work." Shahn concludes the narrative with the right panel with a happier life in Jersey Homesteads housing development. References to the importance of unions, is made by a sign on the development's entrance reading "ILGWU," standing for the International Ladies' Garment Workers Union. In the final scene, a group portrait of the Jewish garment union leaders, along with New York Senator Robert F. Wagner who was instrumental in the creation of labor-reform laws, look over the blueprints for Jersey Homesteads. Shahn received this mural commission from the United States Resettlement Administration's new 200 home development Jersey Homesteads project that was created to provide housing, work, and farming opportunities for Jewish garment workers wanting to relocate from New York City and Philadelphia; many had lost their jobs due to the devastation of the Great Depression. This expansive and detailed mural reveals Shahn's commitment to improving the human condition through narrative storytelling, and his great skill at creating complex compositions. Artwork description & Analysis: Resources of America (1938-39) is a commissioned mural Ben Shahn completed for the Bronx Central Post Office in New York City. His companion Bernarda Bryson served as his assistant on the project. The New Deal Program's Treasury Section of Painting and Sculpture, whose purpose was to oversee the commission of the best art possible for new federal buildings, selected Shahn's as the winning design. For example, one of the thirteen panels portrays both an agricultural and an industrial worker, displaying one man stooping down low to pick cotton, and a woman working at spindles in a mill. The central panel which is placed on a higher plane than the other panel depicts American poet Walt Whitman speaking to an assembled group of workers and pointing to a text-filled blackboard. His long, white beard makes the poet resemble a combination of Moses and Karl Marx. Although not intending to be controversial, the Bronx mural did indeed elicit harsh criticism due to Shahn's inclusion of a quote by Whitman who was then on the Catholic Church's Index of Forbidden Books. Originally Shahn planned to include text from Whitman's poem "Thou Mother with Thy Equal Blood" but when preliminary sketches of the mural were displayed at the Bronx Post Office, a local priest took notice. Shortly after, Reverend Ignatius W. Cox, an ethics professor at Fordham University, publicly denounced the mural in front of thousands gathered in a church as being a government statement against religion. Cox urged parishioners to join him in demanding the text be changed, and began a letter-writing campaign which garnered much press coverage. As, Shahn had agreed when taking the job to make changes if there were any objections, he switched the text to lines from Whitman's poem "As I Walk These Broad Majestic Days." Despite the successful reception to the altered mural, the experience made clear to the artist the weight of censorship and the power that even a few members of the public could exert over an artist's work. Artwork description & Analysis: In the early 1940s, Ben Shahn created paintings which became the basis of anti-war posters sponsored by the United States government. Shahn's This is Nazi Brutality is one of the most famous posters he designed during his position at the Office of War Information (OWI). In response to the Nazis total destruction of the town of Lidice, Czechoslovakia, and its inhabitants, Shahn's powerful image features a male figure whose head is covered by a hood and whose fisted hands, positioned firmly at his sides, are shackled. He stands beneath a dark and ominous sky and is backed both from behind and on his left side by a red brick wall. The title of the work as well as its theme are stated in bold red letters in front of the figure below which, the news of the event, as it was translated from a radio broadcast. The text reads: RADIO BERLIN.--IT IS OFFICIALLY ANNOUNCED: -ALL MEN OF LIDICE - CZECHOSLOVAKIA - HAVE BEEN SHOT: THE WOMEN DEPORTED TO A CONCENTRATION CAMP: THE CHILDREN SENT TO APPROPRIATE CENTERS--THE NAME OF THE VILLAGE WAS IMMEDIATELY ABOLISHED. 6/11/42/115P. Astonishingly, the OWI officials rejected Shahn's designs as too "violent" and "not appealing enough." Fed up with such disagreements, Shahn resigned after one year. Shahn's confrontational posture towards officials conveys a great strength of conviction in his topics. Through the means of bold, graphic design, using an economy of words, coupled with an image freed from the types of details that typify Shahn's figural words, the reaction to this haunting work is powerful and viscerally felt. Artwork description & Analysis: Ben Shahn's The Red Stairway is a powerful statement on destruction, hope, and the prevailing human spirit. An elderly man, wearing a black coat and hat, reliant on crutches, ascends a red staircase that winds up and then down the side of a ravaged building. In the right foreground, another man in a white shirt with arms raised is depicted buried up to his waist in debris. As with many artists of his era, the horrors of World War II had a profound effect on Shahn and his work beginning in the early to mid-1940s. In this and other paintings Shahn, he chose to depict the devastation of the war symbolically, rather than as realistically or in a documentary vein. Here the man's journey up the stairs seems overwhelmingly arduous and seemingly leading nowhere. This lack of hope echoes the oppressive weight of the effects of war and yet, Shahn is careful to also imbue the work with a sense of hope in the fact that the man attempts the journey at all. The other figure's arms raised despite being stuck in rubble symbolizes an effort to climb out of the destruction and metaphorically echoes the efforts of people to rebuild after the damages of the war. Even the blue cloud-filled sky is a bit lighter above this figure symbolizing the promised gift of another day that comes with each new dawn. This painting is a key example of a major shift in Shahn's work in the postwar period. Prior to the war much of his focus had been on creating works of Social Realism but the war led Shahn to move his art towards the direction of a more "personal realism" resulting in works which offered the artist's own subjective response and feelings to the world around him. While his works became more emotional, unlike many artists of the period, as this work exemplifies, Shahn still maintained a highly narrative and figurative style. Artwork description & Analysis: Throughout his career, Ben Shahn created numerous political posters; this work is an excellent example of the artist's graphic style. A powerfully stark image, the work depicts a gaunt young boy wearing dark pants, suspenders, and a red shirt with his right hand outstretched into the foreground in a pose of begging. His hollow, dark eyes look slightly downward preventing the viewer from a direct connection to his image. The purpose of the poster is made clear in the simple text which states: "We want Peace" and "REGISTER VOTE." 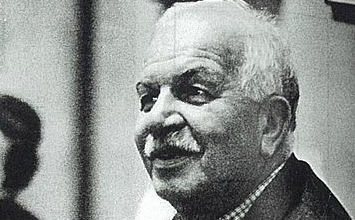 Shahn first joined the Congress of Industrial Organizations' Political Action Committee in order to reelect President Franklin Delano Roosevelt. After FDR's 1944 victory, Shahn became the CIO-PAC's director of the Graphic Arts Division. During this time he designed many posters to encourage Americans to get out the vote and to support the Democratic Party. Shahn's mastery in communicating his message is achieved by capturing emotions and the human spirit on the canvas as is the case with this work; such as the child's haunting eyes as he begs for a better tomorrow that can be achieved through the power of voting. Shahn had a productive career as a commercial artist and illustrator, and felt there was an importance to being what he called a "communicative artist" and saw the power that reproducible works such as posters have in reaching a much larger and more diverse audience than that of a painting. Artist Andy Warhol is one who spoke of the great influence Shahn's illustrations had upon his own work. Artwork description & Analysis: Ben Shahn's painting Allegory features a red beast with both wolf and lion characteristics and flaming mane standing over a pile of four dead children's bodies. Neither the beast nor the bodies are anchored to anything rather they seem to float in a void of blue, red, and purple colors. In the left corner, a subtle hint of yellow seems to struggle through, echoing that of a sun behind clouds and; in the lower left corner of the canvas, Shahn depicts a group of bare red trees against a small patch of green background. Shahn maintained that the inspiration for the painting was the story of a Chicago man, John Hickman who after his four children died in a tenement fire, killed the building's landlord who he believed was responsible for its start and received two years' probation after a manslaughter conviction. Shahn was commissioned to illustrate an article about the case for a Harper's magazine article in 1948. After the job ended and still thinking about the story, Shahn chose to explore the theme further on canvas. When the painting was first exhibited in 1948 it received some negative criticism including from The New York Sun's critic Henry McBride who maintained that the painting conveyed an anti-American sentiment and was paying homage to the Soviet Union. To McBride, the work was clearly communist since the beast was painted red. Shahn denied McBride's interpretation and maintained that the critic was erroneously misreading the painting. As with many of his works from the mid-1940s on, Shahn also included many personal references such as the fire which dates back to his childhood. As a youth in Lithuania, Shahn watched his Grandfather's village burn to the ground, and later repeated the experience in Brooklyn, when his father rescued him and his siblings from a house fire which destroyed all their possessions, lost their financial stability, and ended up injuring his father. Wolves also had a personal association as his mother had told him stories of her being pursued by wolves while living in Russia. Highly symbolic, the work typifies Shahn's use of mythology and allegory to create his visual narratives. Working in a more contemporary, expressive style, Shahn proves that both personal events, as well as tragic emotions, remain pertinent to modern art. While always exploring new forms and designs, Shahn always united these pictorial elements with deep narrative expressions. Artwork description & Analysis: Ben Shahn was a union member, and remained committed to telling the stories, and the hardships of workers and laborers throughout his lengthy career. Shahn imbues Miners' Wives with a haunting sense of sadness. The artist depicted three figures in front of a red brick wall. The main focus, however, is the woman at right in the foreground, wrapped in a thin shawl, standing with arms clasped in front of her. Behind her another woman sits with a small child in her lap while above her a man's jacket and pants hang on a hook on the wall. In the background, visible through a rectangular doorway in the wall, two male figures in black coats and hats stand facing a building some distance behind them. The theme of the painting appears to be waiting for news of their husbands', miners, fates. Shahn often drew inspiration for paintings from illustrations he had made for articles. The idea for this and five other paintings on this topic came from illustrations he was commissioned to create for a Harper's magazine article about the Centralia, Illinois mine disaster that killed 111 miners. The article was published in March 1948, and titled "The Blast in Centralia No. 5: A Mine Disaster No One Stopped." Long after its publication, the fate of the miners and their families stayed with Shahn; he felt compelled to use his art to further their story. In this painting, Shahn concentrates on the wives' agony as they wait endless hours for their husbands to return home, and then, depicts the harsh reality of their lives as widows. The two men in the distance, while ambiguous, perhaps represent the messengers of this tragic news. The topic of mines was familiar to Shahn as he himself had gone into mines earlier and his second wife grew up in a mining area. Further, Shahn was a lifelong supporter of laborers and unions, such as the United Mine Workers Union. Possessing a personal connection to the subject, this painting demonstrates Shahn's expertise as a figurative, realist artist, mastery at creating works that emotionally connected with viewers and his ability to capture the stories of important current events. Artwork description & Analysis: This is one of a series of works by Ben Shahn collectively known as the Lucky Dragon paintings. The series includes some of the most profound and darkest imagery that Shahn ever created. At the top center of the canvas, a beastly face with mouth open and teeth bared is looking out towards the viewer with multiple clawed arms and feet barely visible in a tangled swirl of white cloud-like lines amongst a sea of black. Below the creature, two figures are visible from the waist up, arms outstretched as the figure on the left tries to cover his mouth with one arm. Shahn's prolific career as an illustrator often provided inspiration for his paintings as was the case with this work. In 1957, Shahn was commissioned to illustrate a series of articles for Harper's magazine about the crew of the Japanese fishing boat the Lucky Dragon who were trapped in a shower of radioactive debris on March 1, 1954 - after America tested a hydrogen bomb in the Pacific Ocean. All twenty-three members of the crew suffered the effects of radiation poisoning with one member dying after a long period of suffering. Shahn was very troubled by the story and its grave injustice. The artist was a strong peace advocate who denounced nuclear weapons. Wanting to make a strong statement opposing nuclear weapons, the series of paintings he created consisted of eleven works depicting the tragic event and the aftermath. This particular painting focuses on the nuclear blast itself which is portrayed as a violent creature amidst clouds of lethal poison. Well received when exhibited and even reproduced as a book, the Lucky Dragon series demonstrates that while Shahn had a versatile and rich career, he never strayed far from his political ideals and his strong sense of ethics. Created late in his life, the work was part of the last series of Shahn's career. Rather than overt agitprop art, or loud social protest art, Shahn softens his style and message in order to let the tragedy speak directly to viewers. His is a quiet emotionalism not always conveyed through contemporary art. Tempera on wood - Collection of Smithsonian American Art Museum, Washington, D.C. Artwork description & Analysis: Part of the Human Relations Portfolio series, Ben Shahn drew images that paid homage to slain civil rights activists James Chaney, Andrew Goodman, and Michael Schwerner who were murdered by the Ku Klux Klan in 1964. Using a spare, calligraphic line which emphasizes Goodman's youthful facial features, all of the 3 works depict the men in traditional, somber bust portrait. The simple elegance of each work is achieved in part by the lack of color, with Shahn choosing to render each figure only in black lines. The simplicity of Shahn's line and decision to work with outline when delineating the 3 men, serve to quell the heat and anger of the Civil Rights struggle. The work emits a sense of quiet that invites reflection; the image, although addressing death, speaks as well to peace. First published on 07 Jun 2016. Updated and modified regularly.